The autonomous driving industry continues to gain momentum. That's being led by advances in technology and in particular, in machine learning and artificial intelligence. That's not to say algorithms and robots are taking over the reigns, only that companies can more safely and exponentially teach its self-driving systems how to operate. It helps that it's not just the auto companies doing the heavy lifting. In fact, one could make an argument that at this point, they aren't. Instead, its Silicon Valley doing a bulk of the work, as tech companies continue to fuel the advances in autonomous driving. That's not to take anything away from a company like General Motors (GM - Get Report) , but its favorable positioning in the lineup can be traced back to its 2016 acquisition of Cruise Automation. Almost everyone can say thanks to Alphabet (GOOGL - Get Report) (GOOG - Get Report) , thanks to beginning what's now called Waymo almost a decade ago. Is Waymo the Way of the Future? Autonomous driving isn't a question of if, it's a question of when. Statistically speaking, it boosts efficiency, production, convenience and most important of all, safety. Even though some citizens in Chandler, Az may be frustrated with Waymo's pilot program and even though many consumers continue to doubt that autonomous driving will ever really take flight, it's happening. The reasoning is just too hard to argue with. The problem? It's still really, really hard. Even with machine learning and other techniques that allow companies like Waymo, Cruise, Nvidia (NVDA - Get Report) and others to synthetically test billions of driving miles on a computer. Of course, it would be a lot easier of a task if every car on the road were autonomously operated. But because autonomous vehicles (AVs) are in the minority when it comes to total cars, picking up on the subtle rules of the road can be quite difficult - things like merging into thick highway traffic or communicating at a four-way intersection. Still, many early observers of the space contend that Waymo is the current leader. And why shouldn't they? The company is hoping to commercialize its autonomous driving program by year's end in Arizona and it's ordered more than 60,000 vehicles from Fiat Chrysler (FCAU - Get Report) . 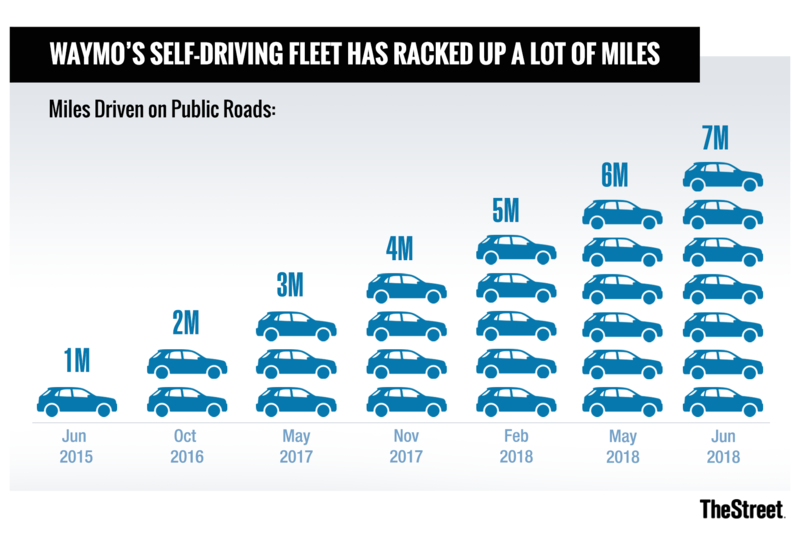 When I spoke with Renovo CEO Chris Heiser last month, he said Waymo is accumulating enough cars to roll out its self-driving program for 10 to 20 cities over the next few years. "That sounds about right to me," Heiser said, calling it a "reasonable rollout." Waymo is primarily working in Arizona right now and offers a service that is, in a nutshell, an autonomous taxi service. The applications do go beyond that, though. The company has said it's working on equipping semi trucks with similar equipment, suggesting that Waymo could become a player in the logistics market. Even vans could be retrofitted for shuttling smaller shipments to and fro. The company has said it plans to expand over in Europe and more recently, a Waymo subsidiary has popped up in China. So while Waymo hasn't even rolled out its first commercial operation in the U.S., it already has its eyes set globally and on different services. Helping all of the pieces come together is the Google brand. Whether its Google Maps, its navigation application Waze, its various travel and calendar applications and even Gmail. They all tie together and can make it that much easier for its customers. For investors, this is the tricky part. Back in May 2017, Morgan Stanley analysts valued Waymo at $70 billion. Last month, that same firm said Tesla (TSLA - Get Report) Mobility is worth $17.7 billion -- about a tenth of the value they're now assigning to Waymo. That puts Waymo up in the $175 billion range. Morgan Stanley's not alone, though. RBC analysts concocted several valuations based on different business models. That valued Waymo between $119 billion and $180 billion. UBS has used a $135 billion valuation. Clearly analysts see potential here. These valuations may seem unsustainable, particularly because we don't know how the pricing of these autonomous models will work, how much competition there will be, how much will change or how long it will take. But when we start looking at Waymo and other autonomous services as more than a robo-taxi and more like a transportation disruptor, these valuations seem more reasonable. The consumer auto market is big, but compared to the multi-trillion dollar global transportation market, it's peanuts. If Waymo's at the front, Alphabet investors will be happy.